Each time I give Pluto a bath, what do you think she does? If you have a dog you don't need to guess. You know! She looks for something unsightly & ungodly to roll in! Drives me nuts! Instead of giving her another full spa treatment I give her a spot clean and then follow up with some PAW Conditioning & Grooming Mist to get her back to her lovely pre-stink self. 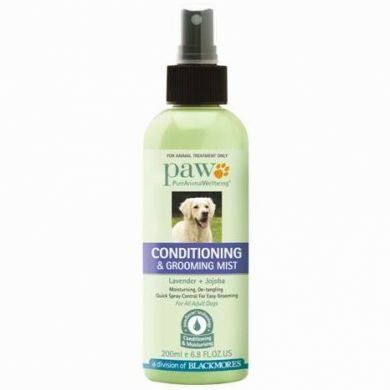 The grooming mist is also very helpful for those of us with dogs who have unruly coats. Spray it on and brush on through for easier detangling action. A freshen up between washes with PAW Conditioning & Grooming Mist moisturises, detangles & infuses your dog’s coat with a beautiful scent between washes. 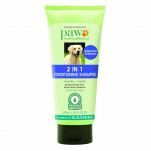 Gentle conditioning & detangling agents for a silky smooth coat. Rich moisturising & conditioning ingredients to boost coat & skin health. Essential oils for a pure & naturally fresh scent. Dosage & Format: Conditioning & Grooming Mist is available in a 200ml recyclable bottle with ‘QuickSpray Control’ that continues working at any angle for effective application to all areas of the coat – making conditioning easy. Spray on between washes to freshen the coat, and apply after bathing for an extra special finish. Read 1 customer review of PAW Lavender Conditioning Grooming Mist. The average customer rating is 4. Its great to spray on after their bath it leaves them smelling lovely and it has reduced the amount of dry skin they have.